A bird's-eye view of the tree of life, showing the vines in red and the tree's branches in grey [Bacteria] and green [Archaea]. The last universal common ancestor is shown as a yellow sphere.EBI researchers have changed our view of 4 billion years of microbial evolution. Christos Ouzounis and colleagues have gained intriguing quantitative insights into how gene families are transferred, not only 'vertically' through passage from one organism to its progeny, but also 'horizontally' through the exchange of genetic material between distantly related organisms. This new view of the tree of life could help us to better understand how disease-causing bacteria manage to stay one step ahead of us in our battle to tackle antibiotic resistance. Since the time of Darwin, the evolutionary relationships between organisms have been represented as a tree, with the common ancestors at the base of the trunk and the most recently evolved species at the tips of the branches. Microbiologists have argued for a long time that this representation doesn't really hold true for microbes, which often exchange genes among different species. Their claim has been that the evolution of these organisms is better represented by a net. Unfortunately, no-one knew exactly where to draw the horizontal lines in this net. Victor Kunin, previously a PhD student in Christos Ouzounis's group, and their colleagues have now constructed a map of microbial evolution, going back billions of years to the last universal common ancestor, that includes these horizontal lines. 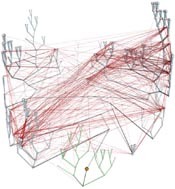 "Reassuringly, evolutionary trees constructed by many independent methods and different research groups are remarkably consistent with each other, projecting the same story. We used these trees as the scaffold of the net, on which we looked for the evidence of horizontally transferred genes," explains Victor. To get a grip on horizontal gene transfer, they used a method called GeneTrace, previously developed by Victor and Christos. GeneTrace infers horizontal transfer from the patchy presence of a gene family in distantly related organisms. The data generated by GeneTrace allowed them to draw 'vines', representing horizontal-genetransfer events, connecting branches on the evolutionary tree. In all, more than 600,000 vertical transfers are observed, coupled with 90,000 gene loss events and approximately 40,000 horizontal gene transfers. Thus, although the distribution of most of the gene families present today can be explained by the classical theory of evolution by descent, anomalies of these patterns are revealed by the 'minority report' of horizontal exchange. To understand the influence of horizontal gene transfer on the microbial tree of life, they focused on the network of vines coursing through the tree's branches. This behaves in a 'scale-free' manner, a term used to describe networks that have an uneven distribution of connectivity and a small number of hubs that are far more connected than other nodes. One property of scale-free networks is their 'small-world' nature: travelling from one node to any other is very fast. [Other small-world networks include social networks, the internet and air-travel connections.] These characteristics allow the hubs to serve as bacterial 'gene banks', providing a medium to acquire and redistribute genes in microbial communities. "This has important implications for our understanding of horizontal gene transfer because, in small-world networks, the shortest path between any two network nodes is relatively small: in other words, a gene can rapidly be disseminated from organism to organism through very few horizontal gene transfer events," explains Christos Ouzounis. A few species, including beneficial nitrogen-fixing soil bacteria, appear to be 'champions'of horizontal gene transfer; "it's entirely possible that apparently harmless organisms are quietly spreading antibiotic resistance under our feet," concludes Christos Ouzounis. A bird's-eye view of the tree of life, showing the vines in red and the tree's branches in grey [Bacteria] and green [Archaea]. The last universal common ancestor is shown as a yellow sphere. Genome Res. 1 July 2005. Page took 0.018394 seconds to load.